** In 2015 USPLabs had criminal charges brought against them as it was found they used synthetic stimulants in Jack3d versus using plant extracts. Would not be a big deal but they were telling suppliers it was a plant extract. I bought three tubs of Jack3d around the time of this original review in 2010 and stopped. There was some sort of chemical taste which did not sit well with me. For that reason I would recommend taking Energize from the Beachbody Performance Supplement Line. A couple months ago Mark decided to poke some fun at me when I said that I still cannot do any one armed push ups during the P90X Chest Shoulders and Triceps workout. I dislike how one armed push ups are near the end of that workout as I’m usually gassed from “Bringing It” by then. The shoulder injury I have from a summer job washing cars (wax on wax off for 10 hours a day) when I was 19 does not help either. My shoulder clicks when it rotates making it uncomfortable to put a lot of weight on it sometimes. This makes one armed push ups hard for me to do even when I try to do one arm girl push ups. Mark said I should give Jack3d a try as it was helping him push through the workouts much harder than before. 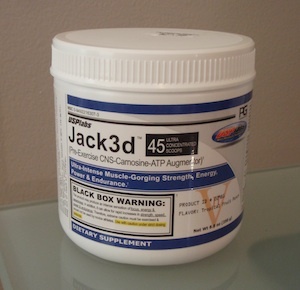 Jack3d is a pre-workout dietary supplement made by USP Labs. You take it 30 minutes before working out and its supposed to give you a boost with your workouts. It claims to provide “Ultra-Intense, Muscle Gorging Strength, Energy, Power & Endurance.” I figured Jack3d was worth giving a try so I rode my mountain bike up to the nearest vitamin store and bought it. I went with the Tropical Fruit Punch flavor. Even the guy at the register said his co-workers swear buy it. Curiosity was setting in during my ride home. Could this stuff be really that good? When I got home I just had to try it. I read the directions and it said to mix 1 scoop of it with water (since it was my first time using it) and wait 30 minutes. The workout I decided to do was the 30 / 15 workout from Tony Horton’s One on One Vol. 1 collection (It’s now called P90X One on One). I think this might be the hardest workout he’s created that I’ve done. Its an hour of doing 30 push ups then 15 pull ups, 30 push ups then 15 pull ups, switching the different style every time. Even Tony has to drop his numbers in the workout. I had done this one time before so I knew what to expect. The first time I did this workout I did 240 push ups and 54 total pull ups. What I did not expect to happen was a rush of energy that helped me do 268 push ups and 67 pull ups. That’s 28 more push ups and 13 more pull ups. When I was all done I even grabbed my 50 pound resistance band, wrapped it around my pull up bar, and did 30 lat pull downs. After those I went right into the P90X One on One Killer Abs routine and finished it with no problem. I usually struggle a little with it as I’m tired but not so this time. Needless to say, I was pretty err Jack3d about my first time using it. Where There Any Side Effects Of Using Jack3d? Yes. Mark told me about the “Tingles” ahead of time so I knew those were coming. I did feel a little jittery during the workout but I guess that was the Jack3d kicking in. My face felt a little warmer than usual when working out also. The one side effect that I wish I would have known about was not being able to sleep. The first time I used it I took it around 5pm at night and was done working out around 6:30 pm. I took the P90X recovery drink afterwards and made some dinner. However, I was not able to fall asleep until 3am. I tossed and turned all night. What was weird was when I woke up the next morning I still felt full of energy. Another thing was that I did not feel any ups or downs like you would when you drink coffee or an energy drink. Besides the first 30 minutes of tingles I felt a consistent energy for the rest of the day. What About The Next Couple Times You Used Jack3d? I learned my lesson from the first time and took it before working out around 2pm. This time I did P90X Back and Biceps. Even though it had been two months since doing it I was able to hit my previous pull up number and do a couple more reps with the heavier weight. After showering and eating some food I sat back down at my computer and got back to work. I was laser focused for the next 3 hours. I don’t know what it was but I got so much done. This has been the case every time that I’ve taken it. I’m guessing its a mix of how I feel after working out and the Jack3d. I’ve done the 30 / 15 workout 3 more times since then using Jack3d and my last time was my best, numbers wise at least. I did 323 push ups and 74 total pull ups. This is a increase of 83 push ups and 20 pull ups. I did the 30 / 15 workout 5 times in 8 weeks. I’m guessing some of those improvements were due to me getting stronger from doing the workout. However, this workout is somewhat similar to other P90X workouts so I already had a good base to begin with. I’d say those results were 80% hard work and 20% Jack3d. Did You Use Jack3d Before Playing Sports? Yes. I played in the Octoberfest Softball Tournament at Liberty Park near my house and mixed in two scoops of Jack3d in my water on my way to the field. I did feel a little jittery during the first game but was full of energy. I did feel a little faster on the base paths too. This says a lot as speed has never been a strength of mine. Again, I felt more focused through out the entire tournament and played very well. Besides not eating enough between games I did not feel all that tired. We started at 9am and were knocked out on our 5th game at 5pm. Have You Used Jack3d Before Running? Yes. I really felt like going for a long run two weeks ago when the weather was nice. I mixed in 1.5 scoops of Jack3d and started running. It was not until mile 8 that I started to feel a little tired. Its been almost a year since I’ve ran more than 5 miles so I have to think that the Jack3d was able to carry me through some of it. What Do You Think About The Black Box Warning Label? “This product may produce an intense sensation of focus, energy & awareness. In addition, it can allow for rapid increases in strength, speed, power & endurance. Therefore, extreme caution must be exercises & should not be used by novice athletes. Use with caution under strict dosing protocols.” I would have to agree with all of this. Am I a novice athlete? That’s all I really have for you about Jack3d. I’ve read a couple other reviews about Jack3d being safe or not and the one thing that it said was to take a week off from it every 3rd to 4th week depending on how many days a week you use it to get it out of your system. I’m using 1.5 scoops of Jack3d before every workout 4 days a week. I have to say that I really like it so far and am doing the week off thing. I’m even thinking about taking some with me when I go on my snowboarding trip this year. If it turns into “Crack3d” as my friends call it then I’ll be sure to update that here. Otherwise I would recommend somebody trying it before working out.